Teachers matter. They are more than talking heads on a computer screen regurgitating instructional material to memorize for a test. They are Robin Williams in Dead Poets Society, the people who inspire and enlighten and change us in a lasting and fundamental way. My Robin Williams announced his retirement as a classroom teacher. This person came to our school with fresh ideas and taught my English class with props like Weird Al to introduce us to satire. We wrote thought-provoking essays about a wide range of topics, and in the process learned about both the world and how to construct papers. Later he served as the faculty advisor for the writer’s club and gave structure to our meetings, writing prompts, critique groups, and a literary magazine. He invited us to his home at the end of the year for a picnic, and we read our work to his wife. She made burgers for a motley group of poets and prose writers. During my senior year, my parents split up, and I went through a bad time for awhile. This teacher saw I was in trouble and took me aside for counseling. I don’t remember the words anymore, only the feeling of being seen, of being not alone. People who know me also know this teacher’s name. He’s an integral part of my story, part of my writing life, part of who I’ve become. We continued to stay in touch during my college years, but I fell away until social media reunited us and others from high school. He blogs wonderful articles about education and other topics. In my book Straight A’s, you see a fictional glimpse of him in this story. The student and teacher have the same relationship through the writer’s club, and ultimately, that teacher has an equally significant and lifelong impact on the student’s life in the book. Teachers matter beyond the classroom. Teachers like mine give us the self-confidence to use education and move forward into the world, to believe in ourselves, and to be encouraged. When that kind of feedback is missing at home for whatever reason, a charismatic teacher can be the only person who gives it. For the right student, this kind of attention from one caring adult is all it takes to make them soar. I was one of the lucky kids. I had multiple good teachers in my life. They made a difference in multiple ways—some of which had nothing to do with my GPA—and I’m grateful to every single one. What about you? Do you have any stories about great teachers in your life? Like or share them in comments. There are dozens of lists of popular YA novels that talk about mental illness, depression, anxiety, and suicide in one or more characters. For various reasons, these kinds of stories have replaced the YA dystopia boom of the early 2010s in our culture. So in case you haven’t heard, Thirteen Reasons Why is the new Maze Runner. Here are my top three recommendations in the depression, anxiety, and suicide YA sub-genre, plus a bonus recommendation. All the Bright Places by Jennifer Niven—This is one of my all-time favorites that combined a love story with depression; it was such a wonderful, heartbreaking, lovely book that I read it twice. And I will probably read it again! By The Time You Read This I’ll Be Dead by Julie Anne Peters—This book is a fast read but hard. The character is so tough, harsh, hard to love, and yet I just wanted to break through her pain and help her. Thirteen Reasons Why by Jay Asher—The premise of this book is fantastic. A girl has committed suicide, and she has left behind 13 tapes explaining why she did it. The main character and the reader go on a journey to understand what happened. It’s a little hard to get emotionally close to the girl through this storytelling, but it’s a compelling read. Of course, after reading the book you need to read my post about why the mini-series is better than the book—and watch the show! Bonus round: If you already like these books and these authors, check out my novel Straight A’s, a high-stakes, romantic story that will simultaneously amuse and inspire. The book shows how perfectionism can be taken too far and lead down a dangerous path. Add to my wishlist now! I watched The Hero last weekend. It’s not often that a movie character reads a beautiful poem in a film, or that the words continue to resonate with me even a week later. The poem was Dirge without Music by Edna St. Vincent Millay. It was a perfect moment, a perfect poem, with perfect sadness. A mechanical beast of name John Deere. Shirtless and muscled, no bees doth he fear. I long to draw his attentions to me. The perfect straight line, across yard, to tree. Naught else, not even sunscreen on his back. And hair will sprout in all manner of place. Trusty green steed will become rust bucket. Still my true love will shine upon his face. To join the cowboy journey, heading west. man when she left the Jacuzzi. inform him about her cooties. I wrote this sappy love poem for you. Infused with copious words to woo. Won’t you please be mine? But as any reader knows, the road to love is never straight or easy, especially for poets. Click Like to let me know you liked this article or add a comment. I always love hearing from readers. One of the big issues in the latest YA novel I’m writing is mental illness in teens. For some reason I’m especially heartbroken by the vulnerability of kids struggling with this issue today and the missed opportunities to help them. All the warnings that go dismissed, ignored, and misunderstood are leading to higher and higher rates of suicide among our youth. · Everything seems hopeless. It just goes on and on. · Everything is falling apart. · I am not enough. · Who I am on the inside doesn’t match the outside. · I feel empty and alone. · No one can see me. Novels about depression and anxiety can help to show teens that they're not alone. Straight A’s is about a girl who feels that everything is falling apart, and there is no way out. Stress and perfectionism push her into a corner. Her cries for help are seen by friends and recognized in time for her to be saved, but for many in our world today, this isn’t true. When I talk about my book, it makes people squeamish. SUICIDE! Ugh. What a nasty topic. Can’t you write about something nice like romance? Why would you write about something horrible like that? Because it hurts a lot of people. Because it’s killing them. Literally. Talking really does help. Writing in journals helps. Sharing with friends, making art, talking to a counselor, and lots of things like that helps. Reading books about anxiety and depression helps. It’s important that feelings of hopelessness and despair do not stay bottled on the inside, alone. Terrible things grow in that darkness. Healing happens in the light, in community. Here's a great list of 10 Young Adult Books That Talk about Anxiety and Depression. Jennifer Niven's All the Bright Places is one of my all-time favorites. What about you? Do you have some other recommendations to share? I'd love to hear from you. Yesterday I spent an hour with a group of students at Sparkman High School’s Creative Writing / Literary Magazine class for a talk on writing novels. The group was a mixed range of artists, writers, photographers, dancers, graphic designers, actors, and even a talented programmer who enjoys creative writing. Would I have any message to engage such a diverse group of teens? Could we connect? After introducing myself, I launched into my journey and described my passion for writing stories since elementary school. These students created the literary magazine for their school, and I also worked on a writing club and literary magazine: an initial connection. The writers were fully in from the beginning. The artists were in. Most of the others were in too. We took the journey together. When I began talking about the steps for self-publishing on Amazon, they finally stopped me. “This sounds like running a business,” one of them said. This generated a flurry of questions about traditional publishing versus independent publishing. What was my literary agent doing for me? What was that experience like? Why was it so hard for independent authors? What would make it easier? They asked so many insightful business questions and grasped the complexities of the problem with selling on a platform like Amazon (search and discoverability) versus a bookstore and why distribution into wider channels is vital. They let me continue through the rest of my deck but asked more questions along the way. We were comfortable with each other now, and the conversation was easy. What did you do in your other job as a technical writer? I explained that I’ve been a manager for a long time now, but when I was a technical writer, I wrote software manuals to describe how to install and use products. Who are your favorite authors? What kind of books do you like to read? How do you build realistic characters? What are your books about? What was your favorite book to write and why? You write about difficult issues. Do you know that they’re starting to censor books now? They’re trying to censor classics like To Kill a Mockingbird. How do you feel about that? Uh, well... I think censorship is bad. Goodness! That was a lot of fun. The students were full of enthusiasm, interest, and challenging questions, and we had a great discussion about writing, which is always my favorite subject. I left them with copies of my recommended reading list, and I'm so grateful that they invited me to their class. I sent my book to the editor this morning! Done! Elation! What a rush. There’s such a feeling of satisfaction when I finish a project like this and nine months of effort results in the delivery of a perfect new novel. I hope she likes it. What if she says it’s terrible? What if there are big problems in the plot or characters or… Oh. Yeah. This feeling comes now. There’s nothing like shipping off the manuscript to that First Reader to shake a writer’s courage. The only cure is to start writing another book. I confess that the business part is my least favorite part of being an indie author. Many creatives share this sentiment, but I feel guilty for disliking it because my Day Job provides the skills for me to handle this stuff. I ought to be a little better at it; I earn my “real” living doing stuff like this for a corporation. Surely I can figure out how to sell more of my own books. This morning I’ve been working on SEO optimization on my website and studying the analytics feature to determine what users are hitting so I can improve the content. The dashboard of pie charts could be either science or roulette wheels. The jury’s still out. How do we match the people who are looking for things with the people who have the things they want? Does the data help us connect buyer and seller? I’m not convinced. When I think about my own book-buying process, browsing feels so random. Almost all of the new fiction authors I discover happen in brick-and-mortar stores, where I wander through the shelves and pick through the spines until something catches my eye. On the other hand, I tend to pre-order my favorite authors on Amazon because I will want their next book no matter what it’s about. In either case, the author website only comes into my concern after I’ve read their book and I decide that I like them and am curious about them. What else have they written? Who are they? What do they have going on? Do I like them? Visiting their site has nothing to do with selling more books. Not really. I’m not sure that what browser, device type, operating system, or source is going to help in all this. In the end, it’s about connection between reader and author. The first encounter might be a chance one, like a passing on a subway platform. Maybe a book is picked up or maybe not. Maybe a site is clicked or not. All of it seems very mysterious. But then, statistics was my worst subject in college. Perhaps I’m dismissing the math because I prefer the mystery. I like the story of the chance encounter better. I like the story of the book discovered by accident. And the rest is happily ever after. I woke up at 2:20 AM again this morning. Yesterday it was 2:00 AM. Daylight savings time always messes with me. The good thing is that falling back an hour gives me an extra bit of time for writing. It gives me sleep deprivation, foggy brain, and a crick in my neck too, but who’s complaining? I’m making progress. Maybe this is why they put NaNoWriMo in November. With this extra hour for writing, we’re all going to finish our novels in record time. I hadn’t set that as my goal, but with 36,000 words in and only 50,000 as a target word count, I can do this, right? Especially with all these extra hours now that I’m not sleeping. I guess I should quit blogging and get to work! "Then Future Unborn" was awarded runner-up at last night's 2017 RONE Award ceremony at the InD'Scribe Con and Book Festival in Burbank, California. The book nomination happened through the InD'Tale Magazine, independently; I did not enter any contest to win this award. What a great feeling! The sun was brutal today at the Sparkman High School Arts Festival. Yesterday may have been the first officially day of fall, but it sure felt like summer is still here. 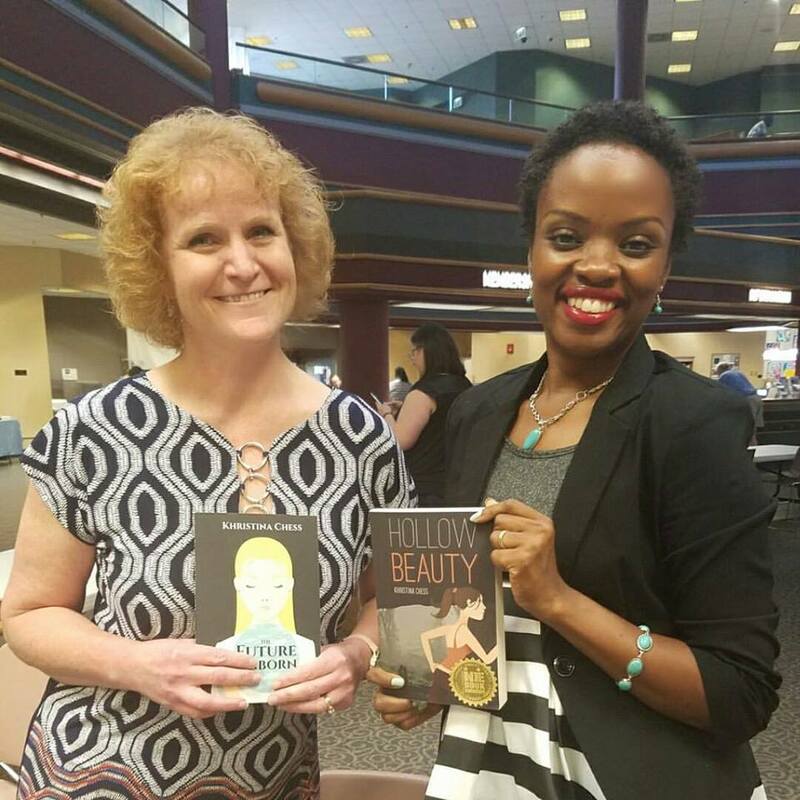 The highlight of my day was meeting two separate readers who'd read my books and met me at events in past years. They stopped by my table to say that they'd enjoyed the books they'd read. One person even purchased another book today. "We were blessed by your books," the second woman said. She and her daughter had both read them. I'm compelled to write. I can't help it. I've been doing it my whole life. But it's moments like those, when someone tells me that they liked something that I read, that always give me a little glow. I'm sending words into the abyss... and someone read them. And was blessed. The Sparkman Arts Festival is coming next weekend. Organizers expect hundreds of visitors to the event and great weather. I'm looking forward to it! 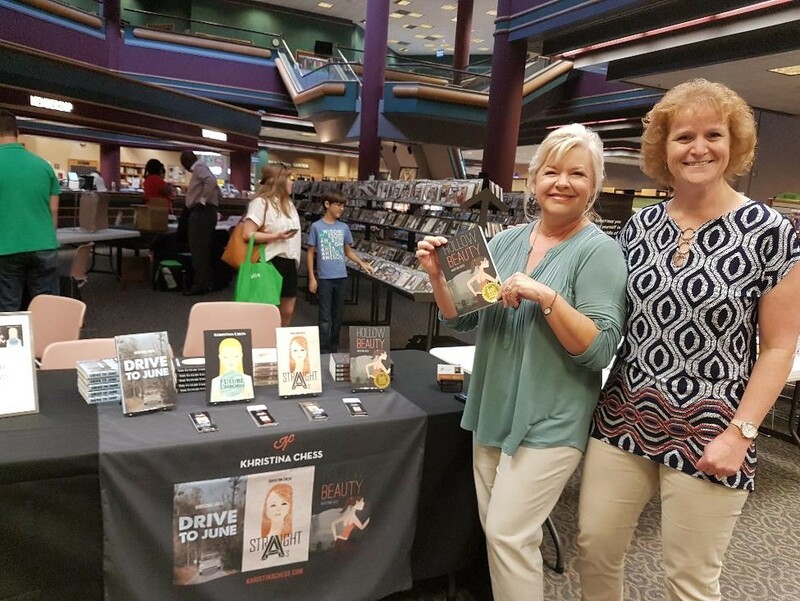 I met several new authors at the Southern Author Expo at the Downtown Huntsville Library yesterday, including Annie M. Cole, a southern fiction and inspirational writer. I’m always encouraged by the other writers in the community; they are so generous with their advice, kindness, and humor about this shared obsession we have with the written word. Annie is definitely one of those people! “I love words,” Toya Poplar said to me. 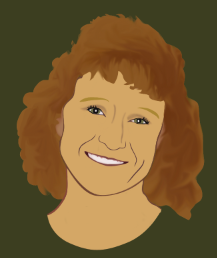 She was my table neighbor, and her book, Stop Write There, is an interactive journal with prompts to help people to write. Meeting her was such a gift. Betty Bolte, the author to my right, is a prolific romance writer in multiple genres and one of the panel speakers of the day. Having such wonderful writers around me made the hours pass quickly, and as usual, I left with a list of ideas for things to try. Thanks to all the library patrons, fellow authors, book fans, and everyone else who came out and made the day such a success! Southern Author's Expo This Weekend! I'm getting ready for the Southern Author's Expo this weekend at the Downtown Huntsville Library, August 19, from 10 - 4 PM. This year, there is a nice lineup of speakers, panel discussions, food trucks, and vendors lined up to make the event fun and interesting. I'll be there with my fellow authors, Amber D. Tran, Ashley Chappell-Peeples, and Angela Blount. I hope we have a great turnout! I’m sitting on two unpublished YA novels. You haven’t seen anything new from me since “The Future Unborn” in 2016, but I’m not blocked in the traditional sense. I’m trying to make the switch from indie to traditional publishing. I’ve weighed the pros and cons of this move. For me and my audience of YA readers, I feel that a traditional publisher is the best way to place my print books into the brick-and-mortar stores where teens are more likely to buy them. I also want to put my books into school libraries. The Jennifer De Chiara Literary Agency signed with me in December, 2016. I wrote another book while waiting for the first one to sell. Now there are two in the queue, and I’m 20,000 words into a third. “Writer’s block” isn’t the problem. Jennifer reassures me about the slow pace. Things pick up in the fall; the publishing business works at a different pace. I’m just used to fast in indie. My editor is fast. The cover designers I’ve worked with are fast. Write, edit, proof, assemble, and publish. I’m in control of my schedule, and I like getting things done. So for my readers out there who might be wondering, yes I’m blocked—but not by writing. The books are here. Just waiting. They’re coming. I promise. Friday, July 14 is the next Art Walk on the Square. I'll be there signing books and meeting readers. Come out and have some fun with us if you're in downtown Huntsville. My interview with Carnegie Mellon was posted on social media this week: Alumna's Double Life Is One for the Books. A little late perhaps, but I finally had some business cards designed and printed to hand out at events. They turned out pretty nice. I’m an oddball among the other vendors selling art, jewelry, and handmade crafts—the only author. People stop and ask, “Did you write these?” or “Are you local?” Others want to know about how they’re published because they are thinking about writing a book of their own. I tell them to write. Just do it. See what you can do. Mother: What do you need? Son: I need a sword. Mother: You do not need a sword. The next Friday Night Art Stroll is June 9 on the square in downtown Huntsville. Come out to see some cool dogs, eat some good food, buy some jewelry, and pick up a few new books.